Sea, Sand & Sky: Early Bird Catches The.. Oysters? Early Bird Catches The.. Oysters? Last Friday was an exceptional day for exploration at Camp Harbor View. A strong low tide led to the exposure of a large gravel bank, which nearly doubled the size of the eastern most portion of Shell Beach. Additionally, the area was dotted with a number of tide pools- a treasure trove for the beach explorers at CHV. I only hoped that the gulls had not pillaged all that the area had to offer. Watching the tide roll in on the expanded beach. Fortunately for us we were able to find plenty of awesome stuff to discuss. The entirety of the exposed area was covered in periwinkles. A few steps on the rocky shoal also revealed the presence of countless soft shell clams, which made themselves known by spraying water out of their feeding holes. The kids loved getting the clams to spray each other. A quick dig and we had quite a large one in our hands. The tide pools also contained plenty of hermit crabs and slipper shells- many stacked in large piles on top of one another. A walk further into the water revealed a few European oysters. 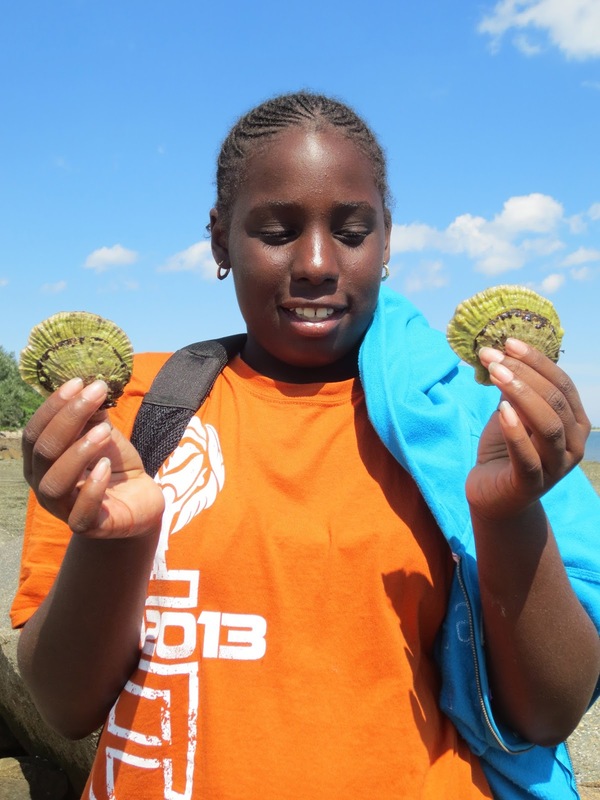 The campers enjoyed these immensely and thought heavily on the potential for pearls. A camper with some tide pool treasure. It is only on these very low tides that these types of creatures can be captured at Camp Harbor View and I am sure that there are many that reside on this exposed area that the explorers at CHV have yet to find. Unfortunately the gulls wait for no one, and are much more synchronized with the tide cycles than myself. As a result our beach combing groups are often late to the party. The evidence of this laid bare on previous expeditions when we have found the gull-torn remains of other species, including sea urchins. Hopefully the next group that gets to go out on this fantastic piece of ocean floor will have even more luck, and beat the impeccable timing of the gulls.